Exposing Spiritual Witchcraft Course will help you identify a spiritual attack and equip you to fight back. Twenty-five years ago I fought the powers of witchcraft against my mind for seven months and won! I didn’t know then what I know now. From my experiences and the Word of God, you can learn how to overcome demonic spiritual assignments against you fast. Firstly, this course has absolutely nothing to do with Wicca, magic, or the New Age Movement. This study deals with stopping the demonic powers of witchcraft that attack your mind when you obey God. Witchcraft is a real wicked force. Learn how to overcome it. These materials have helped thousands of people and will help you too. Spiritual witchcraft is the power of Satan that comes attacks your mind. Controlling witchcraft brings confusion, fear, and loss of identity. Thousands of good Christians don't know how to fight back against the spirit of witchcraft, but that's not God's will for you. The Holy Spirit is our teacher and revealer, and in this course, He will impart the Scriptural discernment you need to overcome the spirit of witchcraft. Get trained with useful spiritual warfare tools to discern and overcome controlling powers in your life, ministry, and church. Learn the six early warning signs of a witchcraft attack. Learn how witchcraft uses false prophecy, weird dreams, and visions to deceive you. Learn how to discern a witchcraft attack. Learn what witchcraft prayers sound like. Learn how witchcraft can murder your reputation. Learn witchcraft's inroads into people's lives. Learn seven powerful ways to guard yourself. Avoid the four common mistakes of every witchcraft victim. Learn how to fight back and win every time. Determine the top six Biblical weapons against witchcraft. Learn how to cast down imaginations of worthlessness. THOUSANDS NOW DISCERN AND STOP THE POWERS OF WITCHCRAFT - YOU CAN TOO! This eLearning course will teach you many powerful truths. Let me help you win the battle against the spirit of witchcraft. 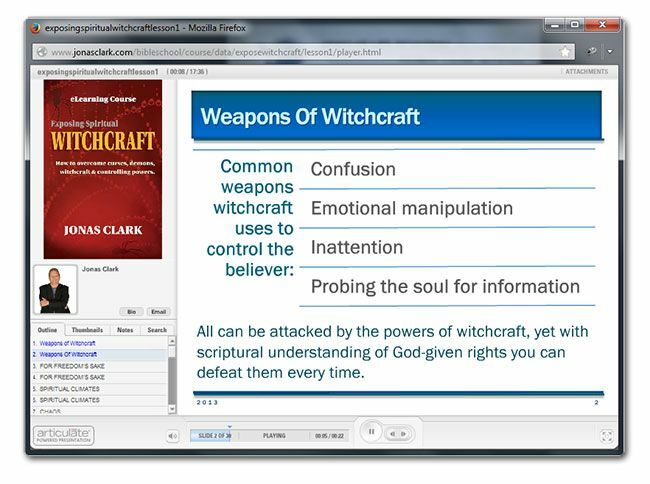 Exposing Spiritual Witchcraft online training course includes twelve class lessons, audio teachings, and reading assignments to help strengthen your life and ministry with online quizzes that monitor your progress and understanding of each lesson.